Is Lucasfilm Already Hiring for Its Next Animated Star Wars Series? Zach Galligan says work on a third Gremlins movie is well under way. Denis Villeneuve talks about the excitement of making Blade Runner 2049. There could be even more death to come in the final season of The Vampire Diaries. Plus, a new look at the returns of The Expanse and Agents of SHIELD. To me, my Spoilers! He has been aggressively working on a Gremlins 3 that takes place in present day. He tantalizingly says there will be some NEW characters and some OLD characters – I guess in the style of a Force Awakens type sequel – One thing we know for sure is they have a writer on board. The only insight I can give is the following: There was a 6 year gap between Gremlins and Gremlins 2 most of that time was spent with them writing and rejecting ideas and re-writing. One of the ideas that was rejected was ‘gremlins in Vegas’ they went with that for 18 months and felt it was too expensive. Eventually they came up with the tower idea, where essentially I’m working for Donald Trump our new President! That took six years to happen. Carl Ellsworth, has been apparently working on the script for a year and a half now. If no new names start appearing on the IMDB listing then that means they like the script. If new names start appearing, y’know Kevin Smith appears, it means it’s back in rewrites with a new vision. Warner Bros definitely wants it, Chris Columbus wants to do it because he’d like to undo the Gremlins 2 thing as he wasn’t thrilled with it and Spielberg wants to do it I imagine – because he’s Spielberg – and why wouldn’t he want to do it. Once he’s found the right script he can attach his name and make a ton of money. Not that there’s anything wrong with that. Hugh Jackman has revealed a new poster for the film. Empire has released new concept art of Kong on a rampage. There’s maybe one or two new shots in this short international TV spot. I’m having the time of my life on this, but it’s insane for sure. Because it is so insane, it gives you freedom. A lot of people on this [film] are children of Blade Runner, raised with the imagination and energy of the original, and have been inspired by those images all our lives. Comicbook.com has spotted an intriguing new job listing on Lucasfilm’s recruitment website for a new storyboard artist position at Lucasfilm animation to work on “an Episodic TV series.” While there’s a possibility this recruitment is for work on the currently ongoing Star Wars Rebels, the fact that it doesn’t name Rebels specifically could possibly hint that Lucasfilm is beginning work on a new animated show within the Star Wars universe. 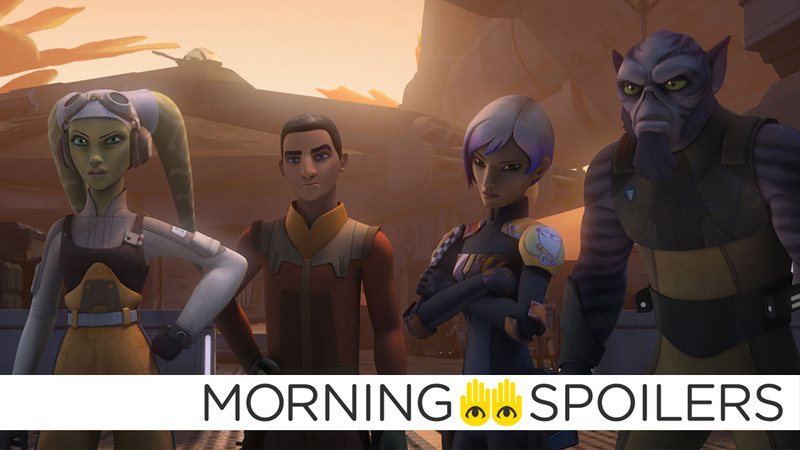 We knew a few months ago when Rebels and Clone Wars supervising director Dave Filoni was bumped up into a new role at Lucasfilm animation that there were at least early plans for a new animated series he would be working on while still being involved with Rebels, so there’s a good possibility that this listing is sign of early work on a new series being currently underway. Executive producer Julie Plec warns of more deaths to come in the final season. Falcone places a hit on Gordon after learning that he shot Mario. Gordon and Bullock discover a follower of Jerome (guest star Cameron Monaghan), who plans to bring him back to life. Meanwhile, Penguin spirals out of control before the biggest television interview of his Mayoral career, and Bruce and Selina deal with Selina’s mom’s return to Gotham. Dorothy (Adria Arjona) and Lucas (Oliver Jackson-Cohen) are approached by a mysterious young girl who has lost her way. Following a tragic accident, Tip (Jordan Loughran) finds herself caught between two powerful forces – Glinda (Joely Richardson) and West (Ana Ularu). Elsewhere, the Wizard (Vincent D’Onofrio) pays a visit to a village and exacts his authority over its citizens. Meanwhile, Jack (Gerran Howell) has a life-changing experience that leads him on a surprising new path with a unique woman (guest star Stefanie Martini). Joely Richardson and Mido Hamada also star. Not one, not two, but three new spots for the show’s second season have been released.